To explain the many benefits of its ground-breaking Line of Sight approach to freeze-drying, SP Chief Marketing Officer - Ian Whitehall will make a technical presentation on April 2nd entitled 'From Formulation to Full Commercialization - Scaling Up with Line of Sight'. The presentation will take place in Technical Theatre 5 from 2:00 PM – 2:30 PM. Our goal in developing the Line of Sight approach to freeze-drying was to enable organizations to bring pharmaceutical products safely and quickly to market by enhancing product and process knowledge at every step and substantiate the process within a data-rich environment. 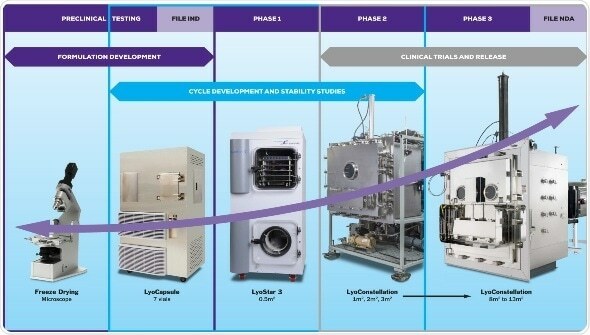 By adopting the Line of Sight approach to lyophilization, organizations will be able to achieve superior product quality and uniformity, in a competitive timeframe." All attendees to the technical presentation will receive a copy of a new white paper which discusses how Line of Sight freeze-drying technologies and process analytical tools have been used to overcome lyophilization challenges during development, scale-up and manufacturing of biologic products. In addition, visitors to SP Scientific’s Interphex Booth #2523 will be able to meet with technical specialists to discuss SP’s full suite of freeze dryers including LyoCapsule™, LyoStar™ and LyoConstellation™, as well as proprietary lyophilization tools including SMART™ cycle optimization technology, ControLyo® Ice Nucleation Technology and LyoFlux® TDLAS (Tuneable Diode Laser Absorption Spectroscopy) for vapor mass flow measurement and inference of critical data. Additionally SP Scientific is the only US manufacturer to offer a complete line of aseptic fill-finish equipment and specializing in sub 200 vpm.